Home PAGASA DOST-PAGASA: Weather Update for Tropical Depression Amang as of 5:00 AM 20 January 2019. 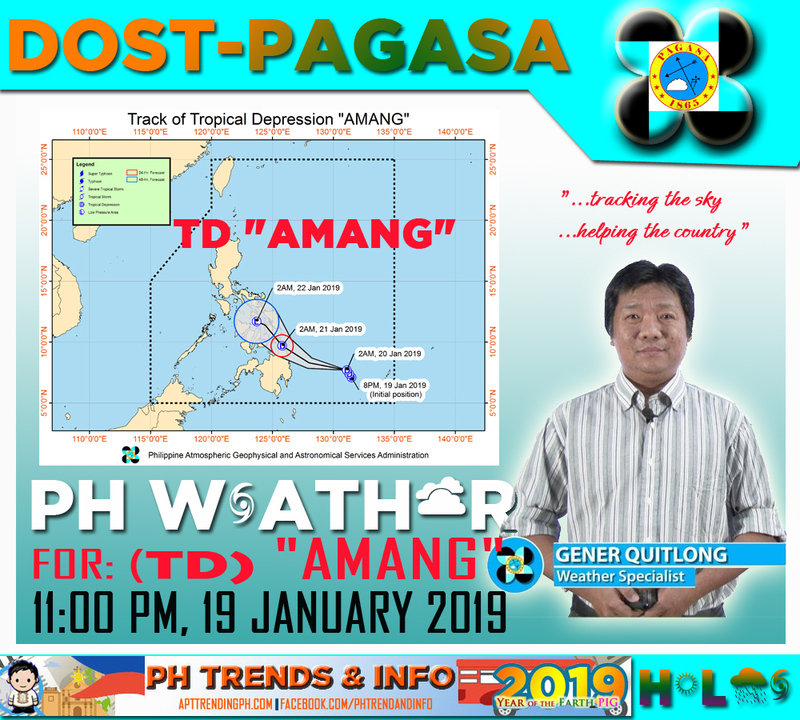 DOST-PAGASA: Weather Update for Tropical Depression Amang as of 5:00 AM 20 January 2019. SYNOPSIS: At 3:00 AM today, the center of the Tropical Depression "AMANG" was estimated based on all available data at 495 km East of Hinatuan, Surigao del Sur (7.9 N, 130.8 E) with maximum sustained winds of 45 km/h near the center and gustiness of up to 60 km/h. Moving North Northeast at 15 km/h. TROPICAL DEPRESSION "AMANG" HAS SLIGHTLY ACCELERATED WHILE MAINTAINING ITS STRENGTH. Possible raising of Tropical Cyclone Warning Signal #1 (TCWS #1) over northern portions of Eastern Samar and Samar in the next Severe Weather Bulletin. Possible disruption of maritime travel is expected over these areas. TD "AMANG" is expected to make landfall over Surigao del Norte mainland - Siargao Islands today (20 January) between afternoon and evening. Beginning today (20 January), moderate to heavy rains will prevail over Caraga, Northern Mindanao, Compostela Valley, Davao Oriental, Eastern Visayas, Central Visayas, Bicol Region, Southern Quezon, Marinduque and Romblon. Meanwhile, tomorrow (21 January), moderate to heavy rains may prevail over Visayas, Bicol Region, Southern Quezon, Marinduque, and Romblon. On Tuesday (22 January), moderate to heavy rains may be experienced over Albay, Sorsogon, Catanduanes, Masbate, Eastern Visayas and Central Visayas. Residents in these areas, especially those living in areas at high risk of flooding and landslides are advised to take precautionary measures. Fisherfolks and those with small seacrafts are advised not to venture out over the seaboards of areas under TCWS #1, the northern seaboard of Northern Luzon, and eastern seaboards of Luzon, Visayas and Mindanao due to the approaching Tropical Depression and the surge of Northeast Monsoon. Agusan del Sur, Agusan del Norte, Surigao del Sur, Surigao del Norte, Dinagat Islands and Camiguin.